House of Lonali is honoured to have been a part of Trash Talk,Third Edition, an event organized by Ananta Sustainables and Zero Waste Lanka, a community for sustainable initiatives working towards a greener Sri Lanka, held on 23rd October 2018, at the MAS Innovation centre. Trash Talk was developed as a space for exchanging, learning, sharing and collaborating around solutions for sustainability, plastic pollution and waste management. With a huge range of local and international industry experts as well as other stakeholders being present at the platform, it was a great opportunity to exchange ideas, learn from each other and collectively contribute towards protecting the environment. Name explained about CSR Lanka’s latest project, a waste collection program that runs on a point system, which is set to be unveiled on the 26th of October in Kaduwela. The program requires consumers to register at the facility and periodically hand over non-biodegradable waste in exchange for points, which can either be redeemed for cash or for sustainable products. Next up was a “Everyday Heroes” session featuring Pearl Protectors, a local organization striving to protect Sri Lankan marine environment by raising awareness, advocating against pollution and mobilizing like-minded, passionate individuals to save the environment. They highlighted several ways in which the marine environment in Sri Lanka is being destroyed and also emphasized on how we are poisoning ourselves by ingesting marine animals that have been subjected to pollution. Plastic pollution, destruction of coral reefs, emergence of a port city that hasn’t undergone proper assessments, high influx of tourists and locals at national parks and in the sea for whale watching, oil spills, illegal fishing were some of the topics discussed. Pearl Protectors help was instrumental in cleaning up a 30 tonne oil spill in Muthurajawela recently, for which the team used cotton sacks to remove the oil from the beach. Colomboplogginggrace, a competition to clean up beaches, is another one of the many programs initiated by Pearl Protectors to help protect our marine life. Presenting the next initiative to protect marine life was Captain Oona Isabelle Layolle, who is currently in Sri Lanka with environmental organization Parley for the Oceans to raise awareness on ocean conservation. Captain Oona is a former Captain of Sea Shepherd, a marine conservation organization that uses “direct action tactics and information campaigns to protect marine life and inform the public of their plight.” Having grown up travelling the world with her seafaring family, she has dedicated her life to fighting against the destruction of marine life and is now a veteran of 9 Sea Shepherd missions all over the world which include missions to prevent shark finning, protect endangered fish and study ocean pollution due to micro plastic. Parley for the Oceans is a non-profit organization founded by designer and artist Cyrill Gutsch in 2012 as a “SPACE WHERE CREATORS, THINKERS, AND LEADERS COME TOGETHER TO RAISE AWARENESS FOR THE BEAUTY AND FRAGILITY OF OUR OCEANS AND COLLABORATE ON PROJECTS THAT CAN END THEIR DESTRUCTION.” , with a focus on plastic pollution. The organization has partnered with several fashion brands such as Adidas, Net-a-Porter and Stella McCartney to raise awareness on plastic pollution, with the most notable of them being their collaboration with ADIDAS on a shoe made in part from ocean plastic. Redesign the material itself and work on designs that bring awareness. Parley’s latest project in Sri Lanka is a beach cleanup on Crow Island to be undertaken by 1000 people from local churches. The next EVERYDAY HEROES session welcomed Ocean Intact, a group of school going teenagers advocating to protect and preserve the oceans. The group raises awareness on ocean pollution, organizes beach clean-ups and are members of the Good Market community, where they rally support for ocean conservation and sell eco-friendly stationery, bamboo straws, compostable tableware, natural fiber bags etc to fund their projects. Founder Janek De Silva and Thasanya Ekanayaka spoke about their initiative to minimize the use of plastic straws by using paper and metal straws. Emphasize was placed on starting small and taking small steps as individuals to tackle a huge problem and effect change. The audience was given an opportunity to get a first hand experience of creating Ananta Sustainables’ latest project, a trash sculpture of a dolphin, through an artfully curated video. The project was initiated to raise awareness on plastic pollution within the coastal communities and brought together a group of locals, travelers and foreigners to create a dolphin sculpture filled with trash collected from beaches in the area. The last session for the day was a panel discussion with Lonali Rodrigo of House of Lonali and Chullaka Hapuarachchi of Eco360. Lonali discussed her beginnings as a designer and what inspired her to venture into sustainable fashion. Although Sri Lanka is one of the largest apparel manufacturer in Asia, much of what is manufactured is exported. Keeping this in mind, Lonali ventured into sustainable fashion to raise awareness on sustainability and promote smart eco-friendly fashion choices in Sri Lanka. Seeing artfully crafted material being thrown away due to regulations inspired Lonali to source for different fabric cutoffs and rejects to give them a new life. Over the past couple of years, House of Lonali has partnered with local artisans to create sustainable and ethical clothing. Sustainability is not exclusive, it’s for everyone. Sustainability should also be fashionable and consumers should be given the choice to buy clothes for their aesthetic appeal, not just because they’re upcycled. Keeping that in mind, we are constantly striving to make our clothing items more affordable and to make items for different audiences, items such as shoes, notebooks and bags just to name a few. Lonali also explained how upcyclists can partner with big companies to upcycle products, be it paper, plastic or fabric and to merge communities to design and manufacture products for the community. Then the audience was addressed by Chullaka Hapuarachchi of Eco 360, a company that specializes in compostable manufacturing. Chullaka spoke about the early days of his eco-friendly initiatives, such as the recycling plant her started 5 years ago and about how Eco 360 came to be. Eco 360 uses starch paste material to manufacture compostable bags and garbage bags and are currently in the process of designing and manufacturing compostable coffee cups and cassava bags. Chullaka highlighted the importance of differentiating between biodegradable and compostable materials. Compostable material is 100% biodegradable whereas items made out of Oxo biodegradable material look like they biodegrade but actually degrade like plastic. Both Lonali and Chullaka were presented with a question by organizer and founder of Ananta Sustainables, Savera ; what can the audience do to be responsible citizens and care for the environment? Lonali discussed the importance of knowing the value of what you’re buying and seeing through the exterior values to find out the story behind the brand or the item. Ask yourselves What goes into it? Who makes these? What’s the impact we make as customers? Lonali raised the issue of the gap between customers and manufacturers, where the customer doesn’t connect with the manufacturer, especially when it comes to fashion. The audience was encouraged to engage with the product so that you automatically start valuing and connecting yourself with it and to set an example to the rest of the people. Chullaka shared his views on the topic, explaining that we have to work together to put the product out and to educate people and sessions like these, is why we need to get involved and that It’s the people’s power that changes things. They were later joined by a volunteer of the Robin Hood Army, an international organization that distributes excess food and fresh food to those in need. The Sri Lankan branch, initially comprising of 6 members, now boasts over 500 volunteers. House of Lonali is grateful to have been a part of the Ethical Isle at Shop Till You Drop organized by ColomboVIP, a premium lifestyle shopping fair offering the best of local and foreign products and services held on 13th of October 2018 at the Grand Marquee, Taj Samudra Hotel, Colombo. Ethical Isle was a collective of Sri Lankan fashion and lifestyle brands with a common mission to empower local communities and protect our environment. It was a great privilege for House of Lonali to have been a part of this initiative alongside local ethical and sustainable brands Kantala Brands, Cane Couture and Selyn. Not only was Ethical Isle an opportunity for us to raise awareness on sustainability, it was also a space for consumers to get involved in the conversation on sustainable and ethical fashion. We are thankful for the enthusiasm shown and feedback we received from our customers, both old and new, about ethical and sustainable fashion and styling yourself responsibly. T-shirts are a staple piece in almost everyone’s wardrobe. While t shirts are versatile, comfortable and inexpensive, even something as simple and mundane as a t shirt does not come without a cost. It takes 2,720 litres of water to make a single t-shirt from scratch. That’s how much we normally drink over a 3 year period. These clothes take up to 40 years to decompose and release various toxic substances to the atmosphere, soil and water. The good news is that 95% of textiles can be recycled. Keeping this in mind, we at House of Lonali have come up with an initiative to reduce tshirt waste by upcycling them into fun, creative and unique clothing and lifestyle items. The Live T shirt upcycling session held at Shop Till You Drop was one such event aimed at promoting a fab and environmentally friendly alternative to throwing away your old t shirts. Our designer Lonali uses simple techniques such as knotting, plaiting and macrame to transform old t shirts into fun and funky tshirts and crop tops. Mentoring aspiring designers in collaboration with Ladies Wine and Bit of Design at Colombo Co-orporative. HoL are thankful/grateful to be a part of the mentor panel for the Ladies Wine and Bit of Design event at Colombo Co-orporative. The opportunity to share my industry experience with aspiring women was fulfilling as well as illuminating. Darshi (Keerthisena) and I met with 10/15 designers at various points in the design journey. Although the designated topic for the session was presenting design portfolios and receiving our feedback, the conversation covered many topics including presentations, work ethic and self-expression. Perhaps the most important thing discussed at the session was the process of crafting a design portfolio that conveyed the spirit and individuality of the designer. Even though the roles of mentor and mentee were decided, the conversation evolved into a knowledge sharing session amongst the participants. I directed some of my own questions at Darshi and received insightful feedback on combining the design process with the business world. From designers that had an already operational sewing unit and a successful export order, to designers who were trying to figure out how to translate their passion for miniature model making into design and fashion journalists who spoke passionately and eloquently about fashion, I learnt as just as much as I intended to share. In a world where women have to work hard to establish a career and then work even harder to make a significant impression, I was inspired to meet individuals that have set out on the difficult journey to combine their passion for art and design with business. To see women take bold steps to achieve their dreams is a wonderful thing. To see organizations bring communities together to embolden them is an even better thing. 4th of July was a special day for the sustainable fashion community in Sri Lanka. 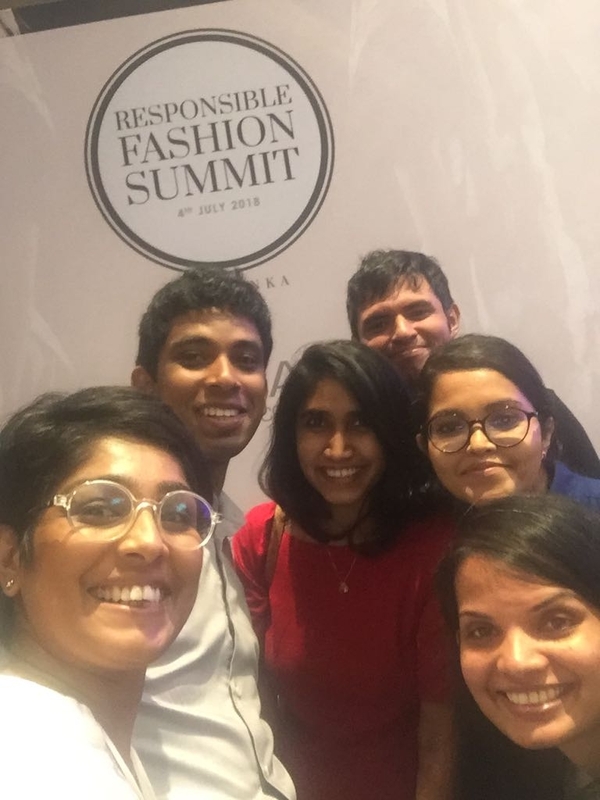 It was a great privilege to attend the Responsible Fashion Summit organized by Colombo Fashion Week. With a huge range of local and international industry experts as well as other stakeholders being present at the platform, it was a great opportunity to exchange ideas and learn from each other. The key learnings from the designer perspective on disposal as a part of designer process was that as designers, our focus should emphasize quality and a design will withstand many trends. We understood this to mean that design should be both contemporary and versatile enough that it will be adaptable to any trend thereby extending the life-cycle of a garment. The second learning was that in a sustainable business model, the traditional supply-chain becomes a value chain that adds value to all stakeholders. This means that from the farmer’s that grows cotton, the mills that spin yarn into fabric, designers and manufacturers of finished goods, transporters, retailers, and consumers contributions to the sustainability of the process is valued. We are delighted that our core business practices reflect the sustainable value chain from sourcing, production and particularly design. This forum and the discussion that followed gave us opportunity for introspection in our business functions and gave us many ideas in how HOL wants to be involved in the conversation and action in sustainable fashion in the future. The discussion focused on both internal and external measures a company can take to ensure sustainability both internally and externally. Sharika Senanayake of MAS Holdings spoke about how responsibility in fashion can be a part of business plan and the baseline for decision making. Ajay Amalean explained about the Eco Go Beyond program of MAS Holdings, of which HOL are a proud partner, with an aim to raise awareness on sustainability among the future generations of the country. The announcement of an exciting initiative on waste recycling between MAS, Hiradramani and The Beira Group is an excellent example of collaborative action on recycling and environmental sustainability. Another great example of collaborative industry action, Hiradramani Group Director Nikhil Hiradramani outlined the implications of JAAF becoming a participant to the Social and Labour Convergence Project enabling the development of a common assessment framework and data collection system, dramatically increasing industry efficiency and reducing audit-related costs. While we are happy to find that our internal business decisions are in line with a sustainable business model, listening to these industry leaders inspired us to contribute more to the greater conversation around responsible fashion and raising awareness on sustainable practices in Sri Lanka. A candid moment with my peers at the summit. (in the picture: Vikum Rajapaksha from Kantala, Naushad Ninzer from DODO, Selyna Peiris from Selyn, Dhanushka Wickramaratne from Cane Couture and Shivani Patel. House of Lonali (HOL) celebrated IWD 2018 with an interactive workshop on Up-Cycling at the Sri Lankan Airlines office in Katunayaka. The session started by building awareness on sustainable fashion and the role consumers play in value chain, specially the impact of their choices and actions. The workshop focused primarily on the role of consumers in buying and disposal of garments. The conversation on customer responsibility at the purchase point of a garment sparked conversation about sustainable sourcing, ethical labour and social impact amongst the participants. The up-cycling component of the workshop came about at the discussion on disposing garments. The participants, all female employees at Sri Lankan ranging from ages 20’s to 50’s, were asked to bring an old t-shirt that would have been disposed to up-cycle into something that they would use daily. The creations included lunch bags, water bottle carriers, and umbrella carriers, bags for shoes and pencil cases. The feedback from the participants was that the techniques taught at the workshop like plaiting, knitting, knotting and macramé were techniques they were confident they could use and improvise with. Some approached with the feedback that they felt encouraged that they could extend their sustainable household practices to the fashion habits as well. We at HOL are grateful for Sri Lankan Airlines for the opportunity to share our enthusiasm for up-cycling and our brand story as well as showcasing our products.